This gallery is a taste of what is ahead for Gator Country subscribers. All season long, Gator Country will provide the most comprehensive coverage of the UF volleyball team. Extensive photo galleries, game stories, previews and player features will be posted every week, so make sure to subscribe to Gator Country today to avoid missing out! Campus USA Credit Union Invitational Most Valuable Player Kelly Murphy recorded a match-high 15 kills on .684 hitting with 18 assists and seven digs Saturday to pilot the No. 8/9 Florida volleyball team to a 3-0 (25-20, 25-22, 25-15) victory against Big XII Conference foe Colorado in the Stephen C. O’Connell Center. The Gators open their season 2-0 for the sixth consecutive year and improve to 16-0 all-time in the history of the Campus USA Credit Union Invitational. Florida hit .411 in the match and demonstrated a strong defensive effort, out-digging the Buffaloes (1-1) 42-19. 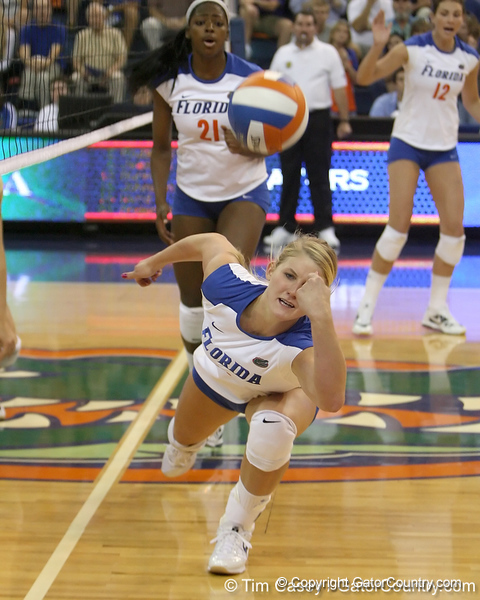 Murphy was one of three Gators to tally double-figure kills in the match. Fellow All-Tournament Team members Kristy Jaeckel and Colleen Ward also reached double-digits in kills. Ward charted her first collegiate double-double with 12 kills on .455 hitting and a career-high 11 digs, while Jaeckel registered 10 kills and six digs. Sophomore right-side/middle blocker Lauren Bledsoe added six kills on .625 hitting. Senior libero Elyse Cusack tied Ward with a match-high 11 digs. Cusack also dished out eight assists in the secondary-setter role, while junior setter Brynja Rodgers had a match-high 19 assists. Florida returns to action on Monday when it plays host to intra-state rival Florida State. The Gators will be looking for their 18th consecutive win against the Seminoles. Opening serve in the Stephen C. O’Connell Center is slated for 7 p.m. ET and the match will be carried live on Sun Sports and WRUF-AM 850. Stay tuned to Gator Country for game coverage and photos.